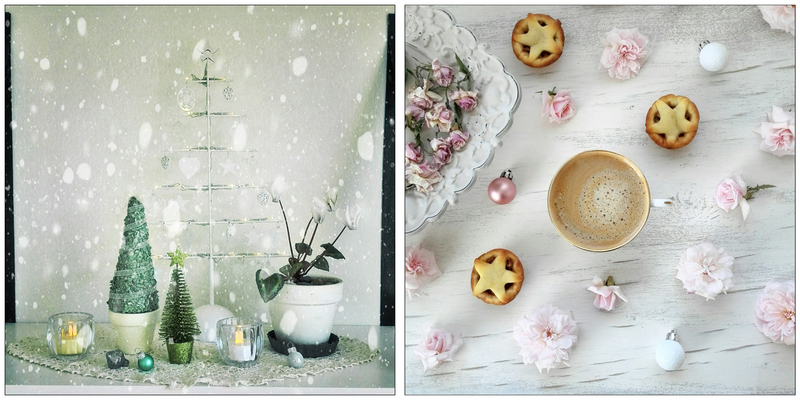 Welcome to December in photos! It's the end of the year, the start of summer, and the middle of Christmas. I'd been working on this crochet tree skirt, and as soon as I finished it I put the tree up. 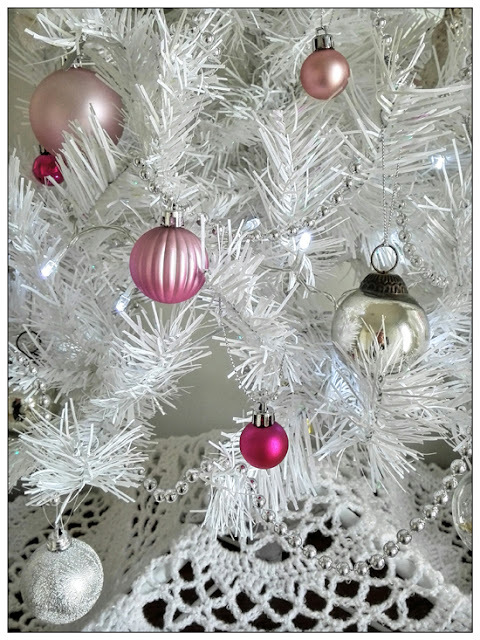 I got a white tree this year and I'm so glad I did! It's a full sized tree and I took it out of the box to have a look at it. My two little helpers materialised and were ever so fascinated... and I realised that it wouldn't even last an hour before it lay in tatters on the floor! Fortunately I was able to take just the top part of the tree and put it in the stand on top of the hall table. And there it has remained safe and unmolested by cats. 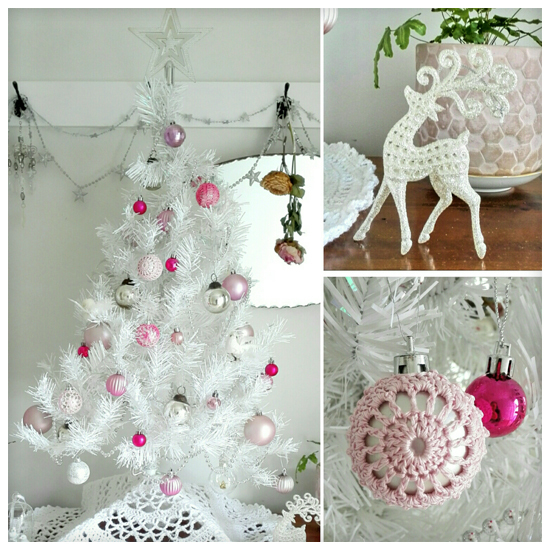 I used all my pink ornaments and realised I needed more, many more. 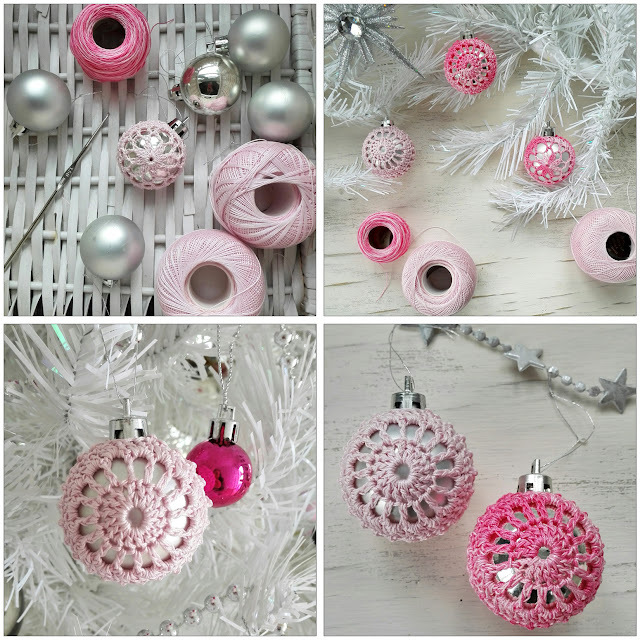 As always, when you go to the shops with a specific colour of ornament in mind you can't find anything, so I decided to crochet little ornament covers. They turned out really well. I will need to make a whole lot more whenever that time comes that I can have the full tree up! Pink, white and silver... my favourite Christmas (and any other time) colour combo! Another thing I love about Christmas is setting up little displays around the house. Whether temporary (until you eat the mince pies) or more permanent (with fairy lights for grey evenings). 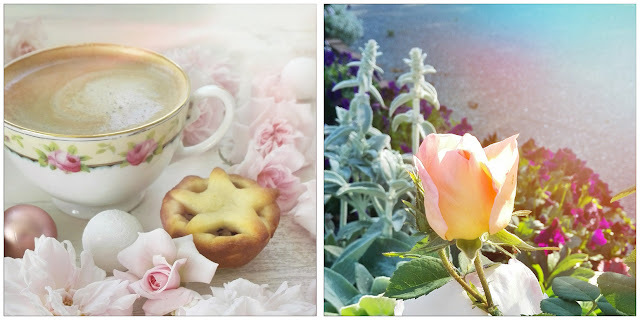 It is summer though, and there are lots of beautiful roses to photograph. 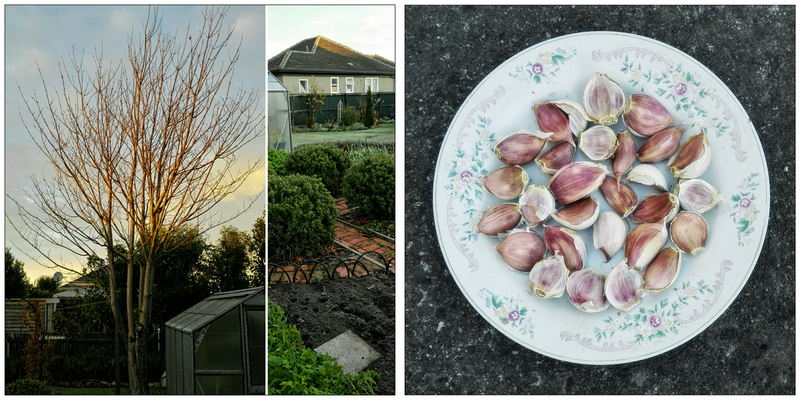 The garden has been just gorgeous this month. 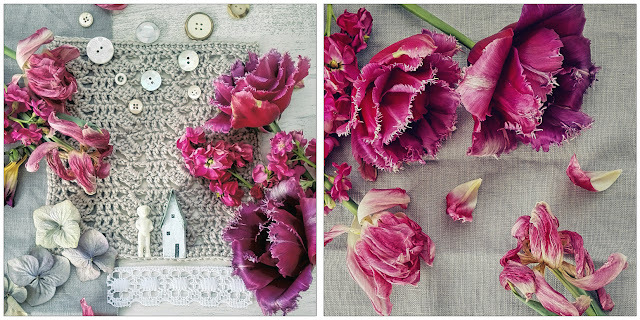 The grass has grown in, and there are poppies, dahlias, lavatera and roses in shades of soft pink and lavender. 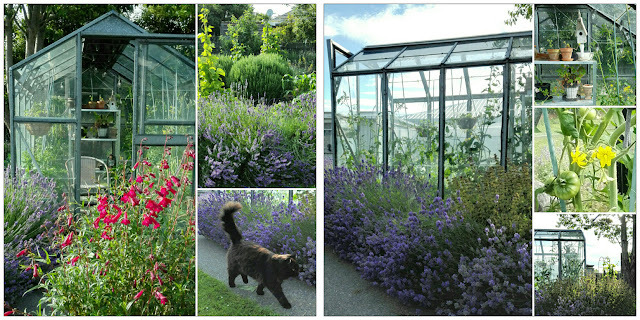 The lavender borders are full, framing the potager, glasshouse and flower gardens. 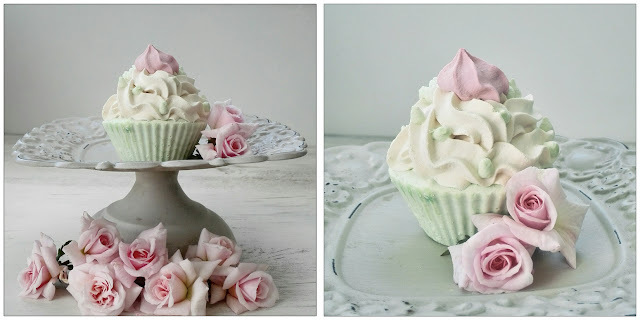 This is a gorgeous cupcake made of soap which I gave as gifts to my workmates. It was coconut and lime flavour and smelled as good as it looked! 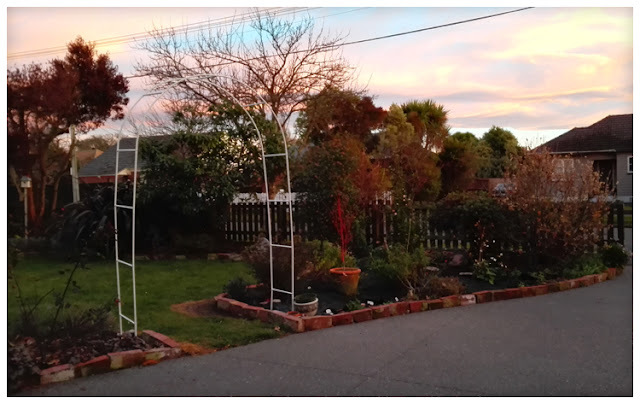 After Christmas I spent a few days in Timaru catching up with family and friends. Then my holiday at home began! 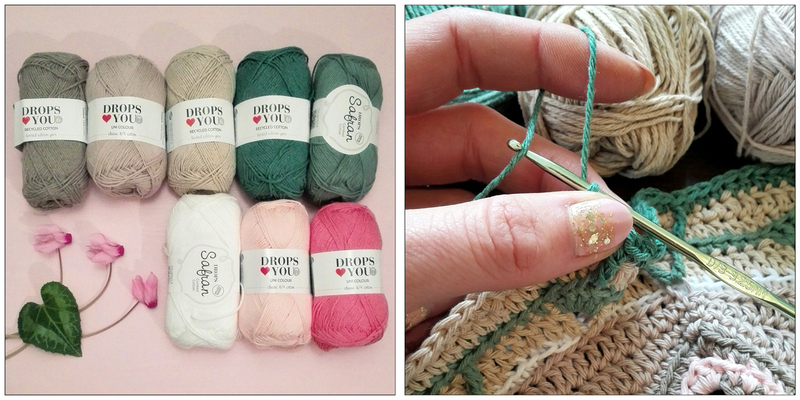 I've got so many fun projects lined up for myself starting with dyeing yarn. I tried three different coloured skeins and it will be fun to see how these work up. I also finished my Vanilla Latte socks, with my first batch of hand dyed yarn! 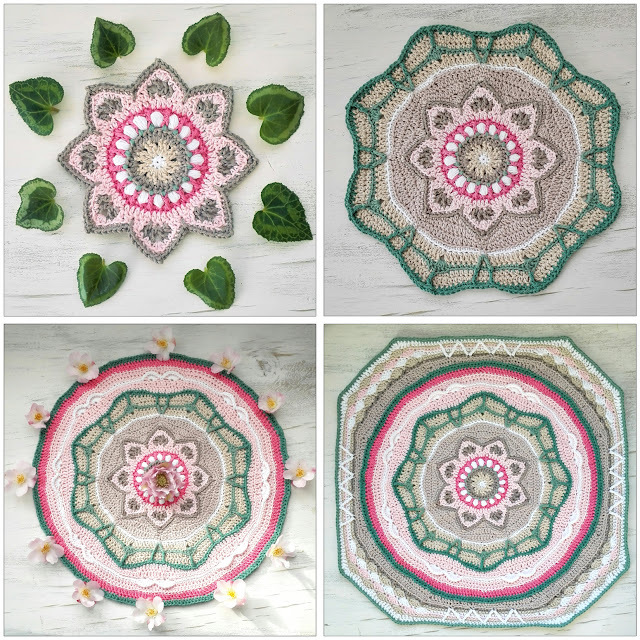 I really enjoyed working on them and watching the colourway develop. 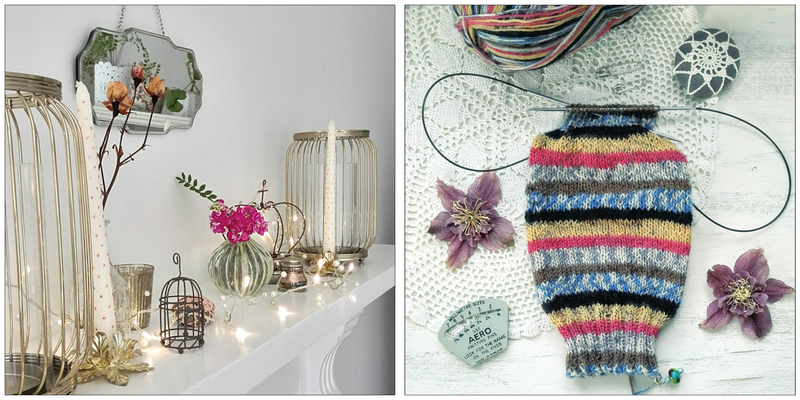 Here's a shot of the summer mantel, with a bit of Christmas mixed in. I later mixed in some Christmas lilies when they came into bloom... lovely! 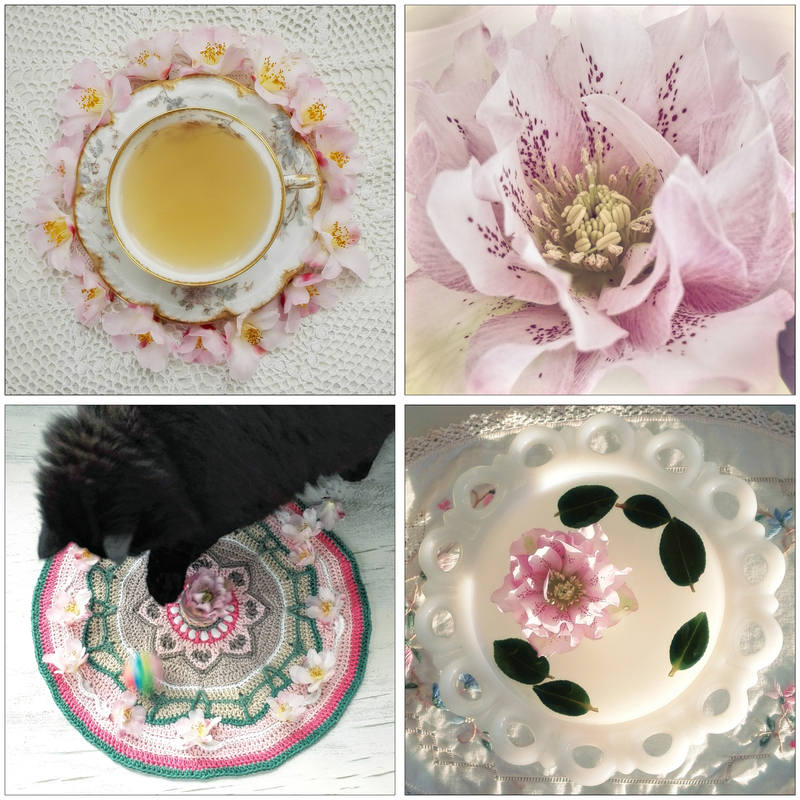 And this is my top nine photos from the year on Instagram. Happy new year to you all! 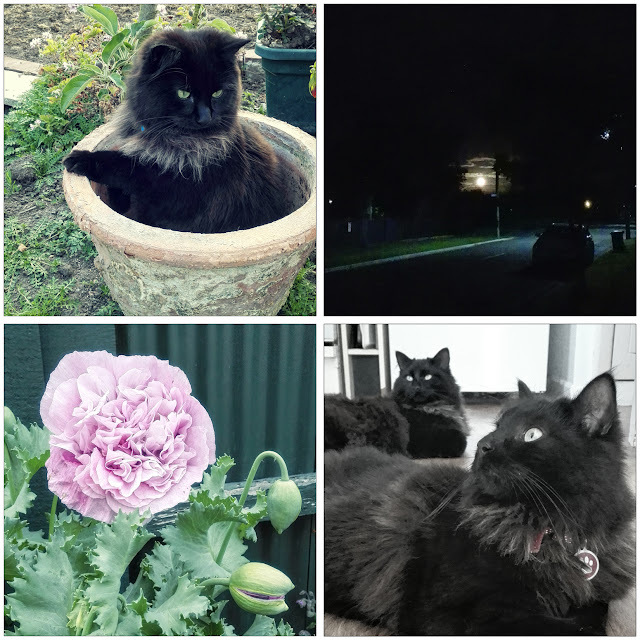 Hi again everyone, and welcome to my November update! I'm finally back on track with my goal of updating each month at the end of the month (or a few days into the new month which is usually what happens!) I wanted to show you the main reason I went MIA for most of October/November, and that is this lawn! It had been getting on my nerves as it was pitted and uneven, and there were patches of grass that was shaggy and a different colour to the rest, plus a trench where a pipe was laid and when the trench was refilled, the soil they put back in was so bad that nothing would grow. So... 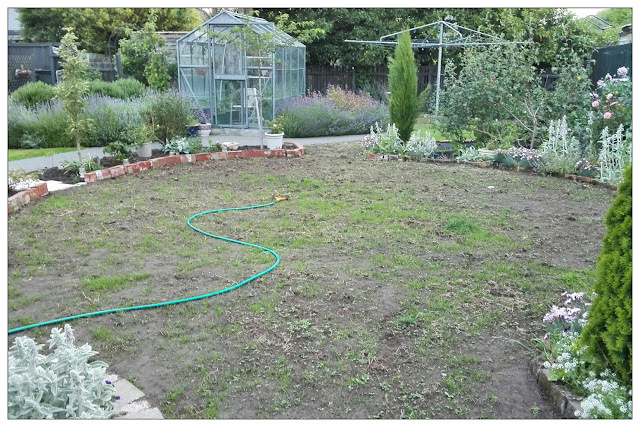 I sprayed all the grass, removed the turf by hand, levelled it by hand, and reseeded it. It's so easy to type that in a sentence but nothing was easy about that project! If you plan to redo your own lawn, I strongly recommend hiring professionals who have machinery, and then rolling out Ready Lawn. But if you're on a tight budget you can do it yourself like I did... just be prepared for about 6 weeks (weekends and evenings) of nothing but digging up turf till you're ready to collapse, then breaking up and raking clods till the surface is smooth, checking it from all angles and redoing it, then sowing seeds and watching as cats and birds ravage your carefully smoothed surface and feast on the seeds. Disclaimer, I did know this would be hard! I also knew it would be worth it and I feel very satisfied when I look out the window and see the green haze that is more vivid every day. Soon I'll have to go through and pick out all the weed seedlings (yay) and sow some more grass to fill the gaps. And we have a hot dry summer forecast (though I'll believe that when I see it) so keeping up the watering is a must. While I worked on the lawn the rest of the spring garden grew and flourished. I also managed to plant my beans in the potager. Peony season arrived! I have about nine peony plants and four of them flowered this year. Three plants had one flower each. Precious little darlings, aren't they? 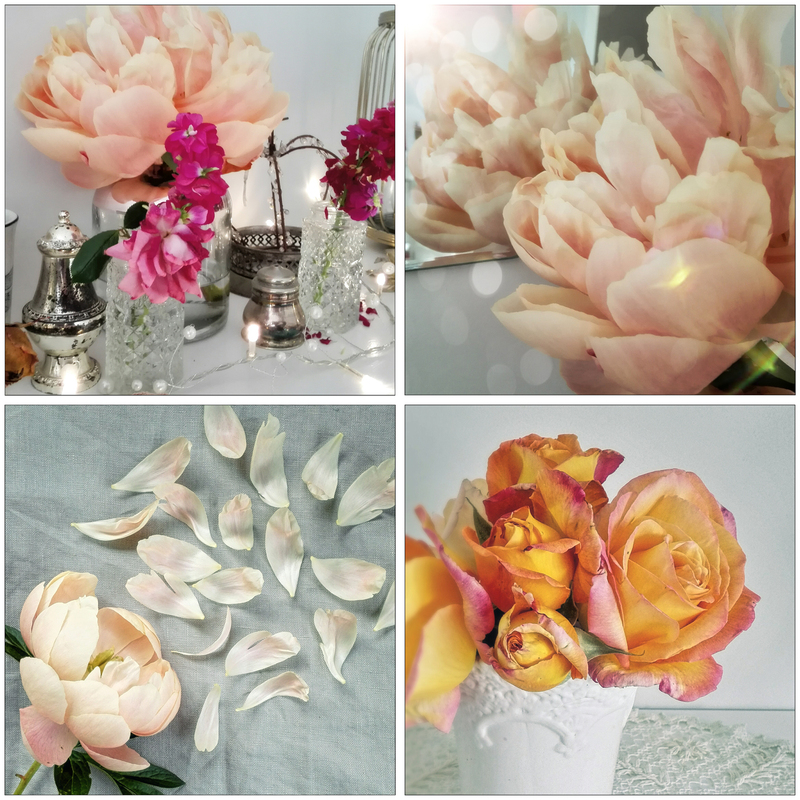 The peony above is Pink Hawaiian Sunset which is a coral coloured bloom which fades to this lovely soft peach. It lasted about 2 weeks inside and was gorgeous the whole time. I also picked a lovely bunch of Peace roses. 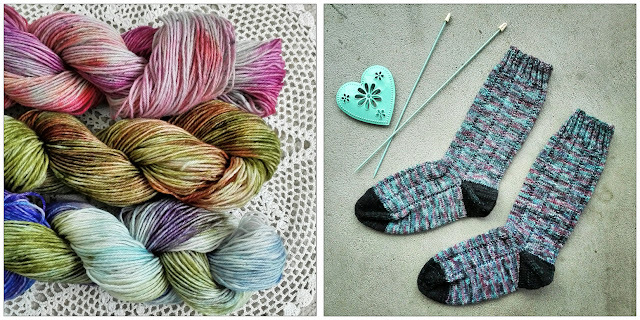 I finished my second pair of knitted socks and immediately cast on the next pair using my own food colouring dyed yarn. It was very exciting to see how the colours worked up! This pattern is the Vanilla Latte socks. 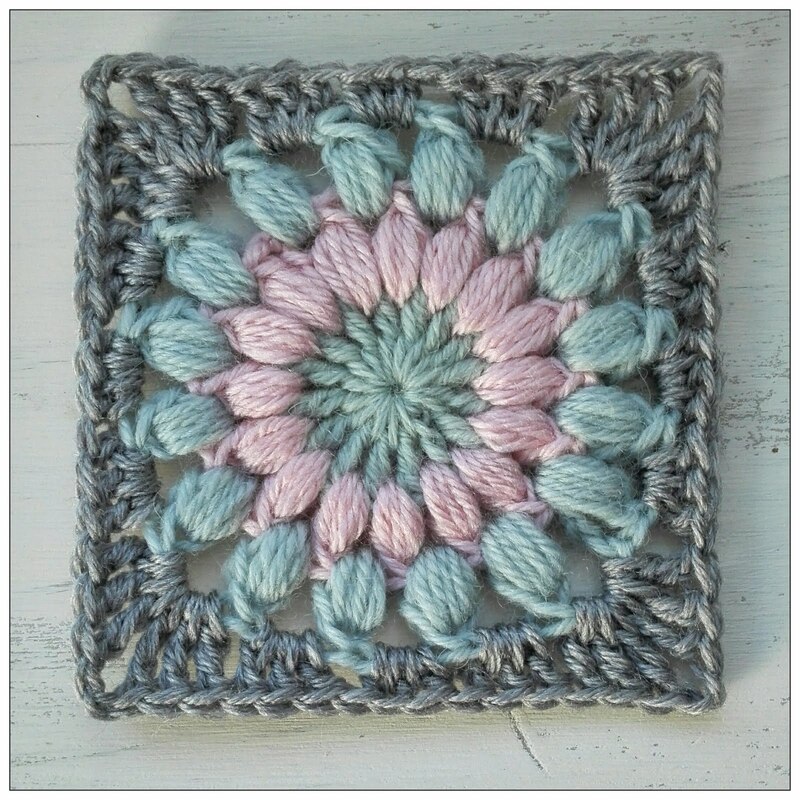 I did a little bit of work on my Circlepuff Square crochet blanket, not a lot I'm afraid but I did block the squares that I finished. Now at some time during the month there was a supermoon. It was a cloudy evening and I don't see the eastern horizon from my house so I didn't see it rise, but at about 9.30 I wandered out of my house and saw a glow in the clouds. I went down the street a little way and saw it rise out of a bank of clouds. My photo isn't very impressive but it was certainly big, and very yellow! After I took the photo it continued to rise and soon disappeared into the heavy cloud cover. So yeah, that's my supermoon story. In other news, Pod and Ini continue to be cute and love to help in the garden (especially Ini who is pictured above testing a pot for me). I eventually got round to taking a photo of my stripey second pair of socks! They fitted well thanks to some tweaks I'd made in the pattern. I decided to try using smaller needles for my third pair, and they have improved my gauge a lot. However it means there's no point referring to these notes as I have to work it all out again with a tighter gauge! Oh well, it's not like you stop at just one pair of socks is it? At the end of the month some Christmas crafting sneaks in... I'm crocheting a Christmas tree skirt. Nothing could go wrong with two cats and a Christmas tree, right? Welcome to October! This is the month when spring really kicks in. The weather was up and down which became the norm for spring - our weather in winter was much more settled! 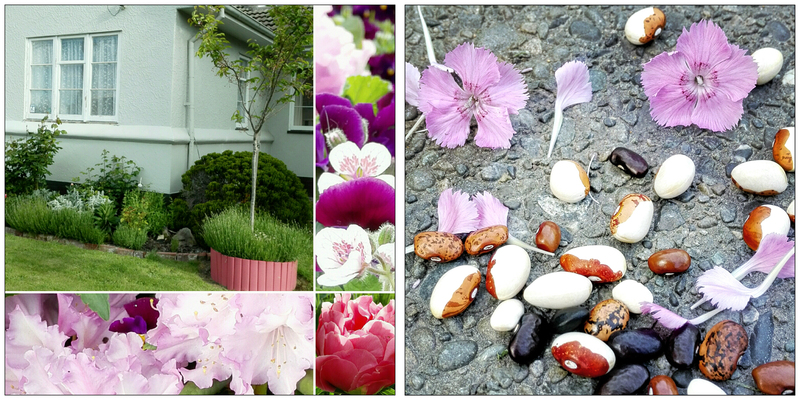 A bit of rain is always good for the garden of course and luckily the blossom trees still bloom no matter the weather. 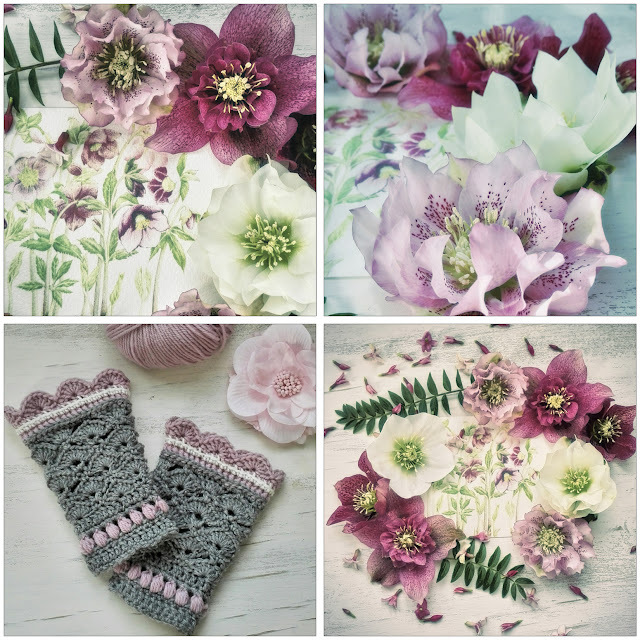 The hellebores continued to flower steadily and looked pretty next to silver-grey lambs' ears. I made a couple more Jan Eaton squares. 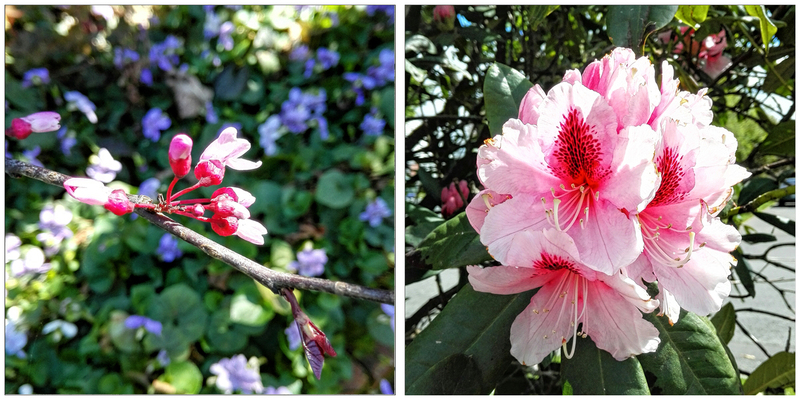 The bright colours of spring begin to show! Left is Cercis Forest Pansy and right is rhododendron Mrs GW Leak. And I had more tulips. These frilly ones are just amazing! 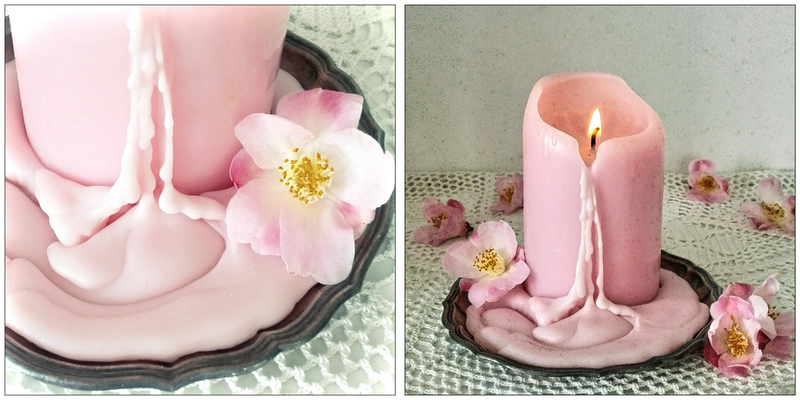 Even more amazing to me was the way the petals age, becoming more beautiful and antique looking as they dry. Next year I really need to plant all the tulips. I tried my hand at yarn dyeing early in the month. It's so much fun and I'm quite happy with the results given that I used food colouring! And just a cheap supermarket packet at that. 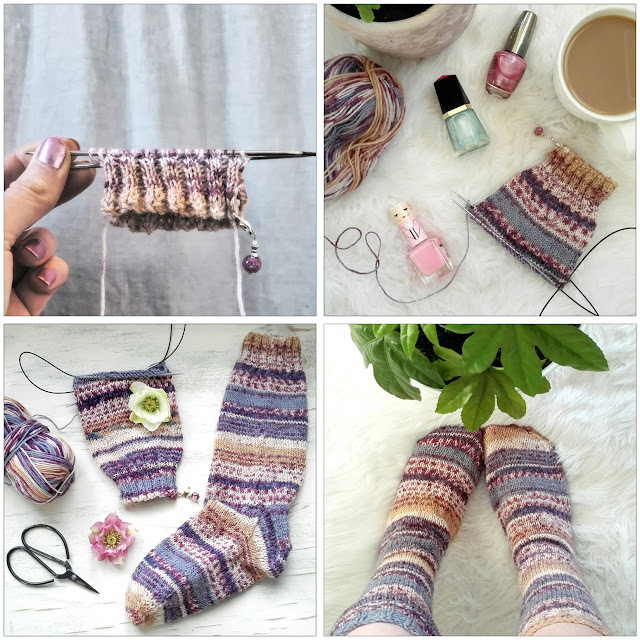 I really can't wait to try some different colour combinations and techniques now, and hand dyed yarn knits up into really fun socks! Peony season began this month! On the left is a Pink Hawaiian Sunset variety. Of my nine or so peony plants, only 4 actually flowered this season. Most of them were transplanted the winter before last, so it would seem that they are taking their time to get established. 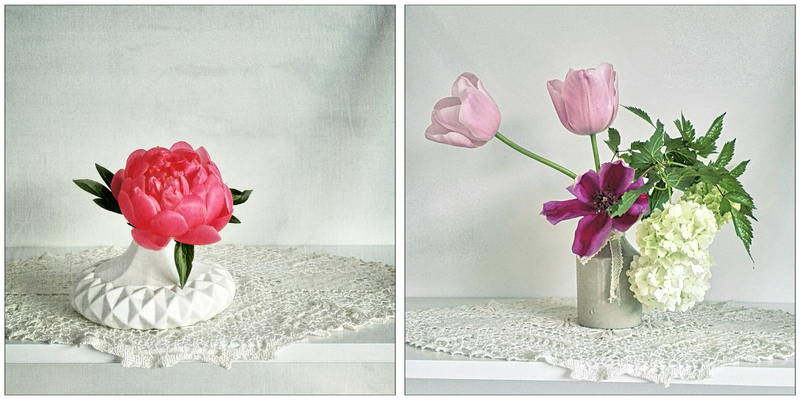 On the right is a little posy of tulips, clematis and snowball viburnum. The clematis was looking great and covered with flowers bursting open. Then it suddenly wilted. I read about clematis wilt, which can suddenly afflict a healthy plant (usually when a young plant puts on a big growth spurt, and it grows too big for the root system to send nutrients to). The advice was to cut the plant back to the ground so it can grow back. I cut it back and there is absolutely no sign of anything growing back... boo. RIP my fancy clematis. This month went fast as I spent the bulk of my spare time working on reseeding the back lawn. Not a fun job, or easy, or quick, but I deemed it necessary. At least I had all the spring pretties to look at! I'll be back soon with November's update. Hi again! It's been a wee while hasn't it? Poor little blog, I had somewhat forgotten you (although I've still been compiling the photos). I keep thinking I'll do it this week, perhaps tonight, but then I pick up knitting or crochet and open up YouTube and the night disappears. Gentle inquiries from family members have reminded me that others read here occasionally, so I'm making a bit effort this week to bring things up to date! And so we begin back in September, still in that transitional phase between winter and spring, where the light is bright and hard and contrasty, and you still need candles in the evening. I finished my In The Yarn Garden cushion. I had put it aside for a little while as something about it wasn't making me feel the joy. I realised that it was the size - it was going to be quite big for a cushion, much bigger than my other couch cushions, and it just wouldn't work for me. So I decided that instead of working a separate back piece and joining them, I'd put some extra rounds on the front piece to enlarge it a bit, and then fold it envelope style and join at the back. That worked well and it was the perfect size. 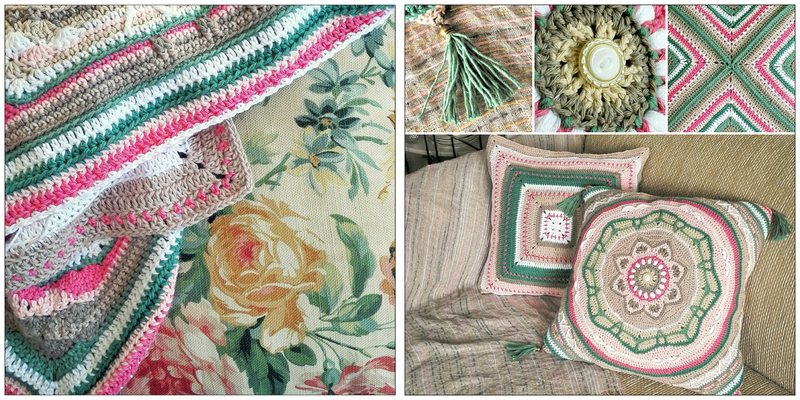 I added tassels to the corners for extra drama and I now call it my boudoir pillow. I made a second cushion from my original back piece, but I cheated and sewed it on the front of an existing cushion cover! So basically I got two for the price of one... gotta love that. 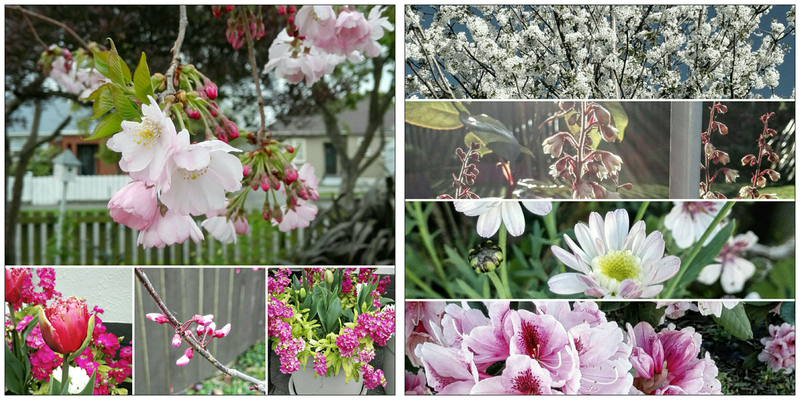 Spring blooms! 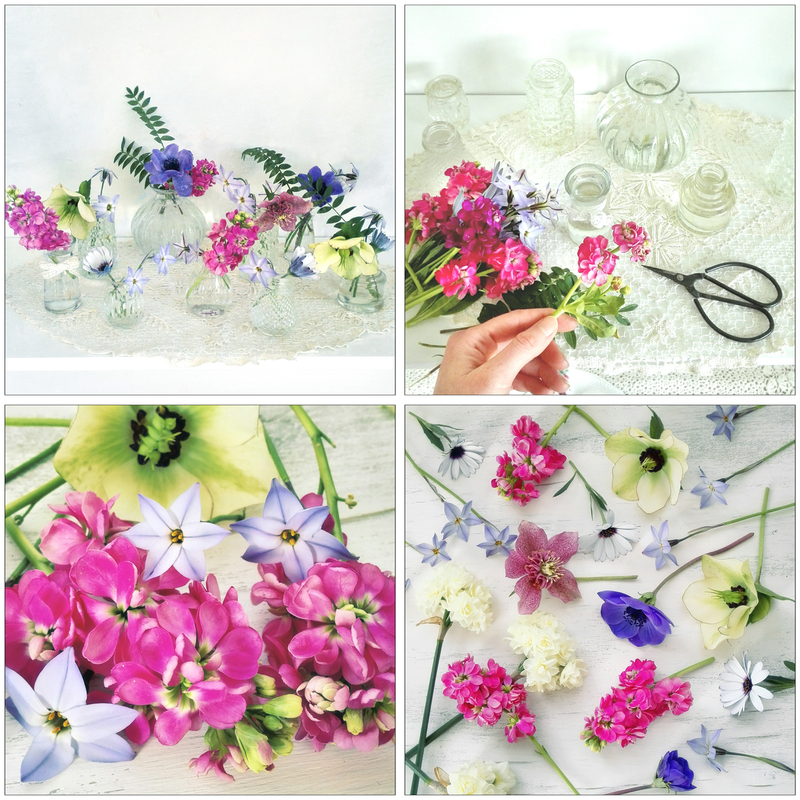 I always love getting out my glass bottle collection and filling them with tiny blooms and blossoms. 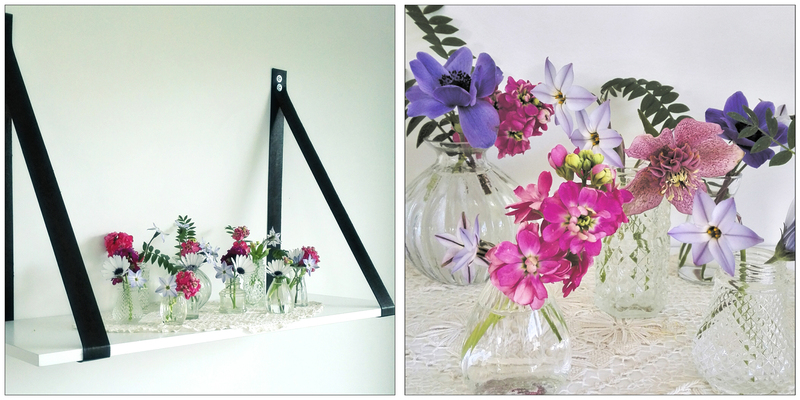 I used hellebores, anemones, stocks, spring stars, osteospermums, and my favourite foliage Jacob's Ladder. I had a week off work too, to work on the garden of course! I dug a new bed lining the back lawn, and I had some trees and shrubs to put in. Naturally the weather was iffy for at least half the week. 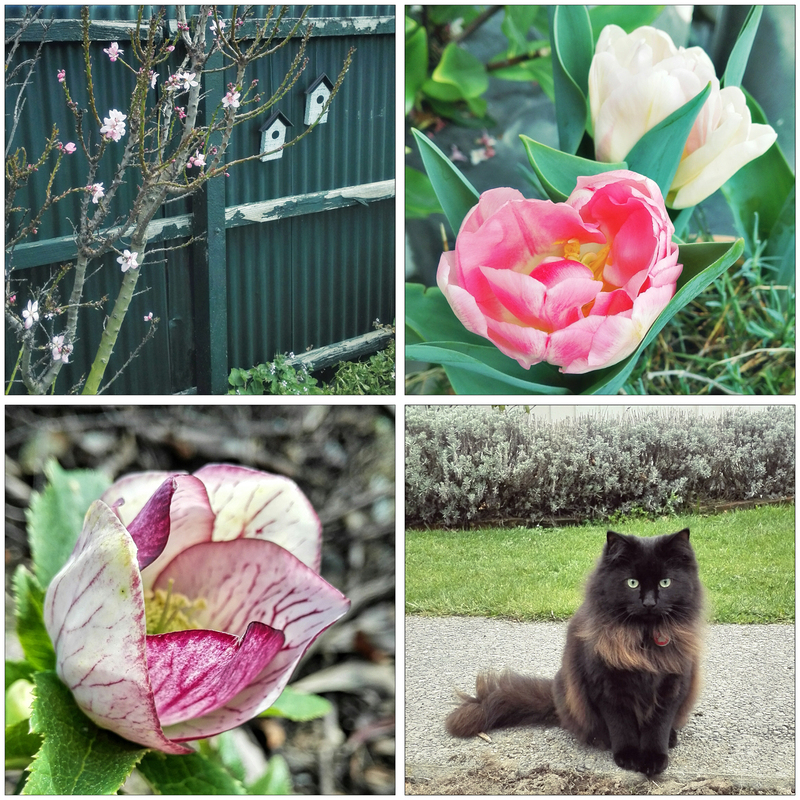 But I did get to enjoy the first blossoms of the season on the almond trees, along with the first tulips (also the first tulips I've ever grown - but not the last! ), and at last a flower on a market-purchased hellebore (bottom left) that is perhaps the most striking hellebore I've seen. Now to try breeding it with a double...! Here are a couple of videos from my phone... I haven't tried adding a video here before so I hope this works! 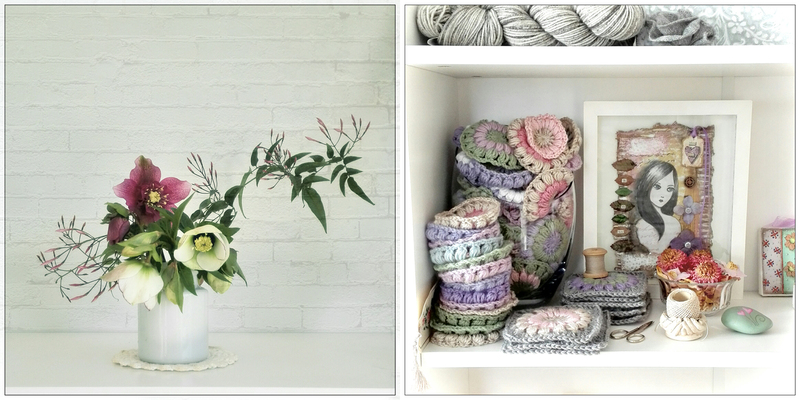 When I wasn't gardening I was crocheting, and I even organised my yarn stash into a chest of drawers (right). It JUST holds everything. On the left is my Jack and Lydia project bag, which is big enough to hold several balls of yarn plus a few smaller project bags for things like socks. It's helping keep my work station (the couch) much tidier! 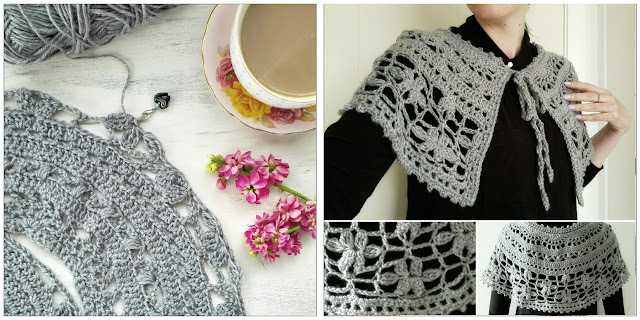 Here's another project I completed quite quickly, a crochet capelet! I just love this and it's perfect for chilly mornings. The pattern is called Chanson en Crochet and you can find it on Ravelry. Make sure you print the errata as well, as it's fairly complex! I found it a lot of fun to make with all the different lace patterns, and it became lovely and drapey when blocked. 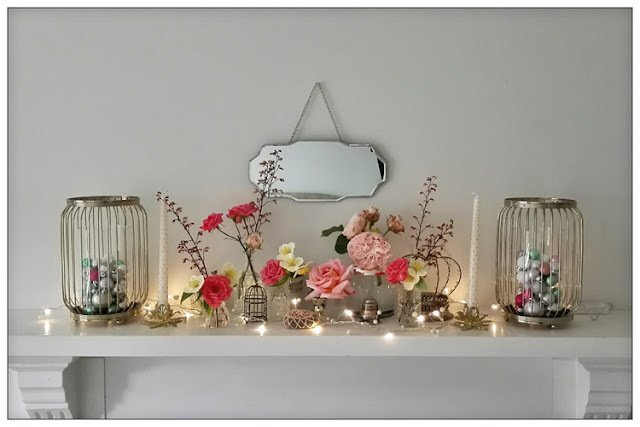 I found these pretty gold metal candle holders at Kmart so I redid the mantelpiece with lots of glass and light metal (and lights). I really love it and for once I don't feel the need to redo it! And I started knitting another sock (my second pair). Will they fit better than the first? Stay tuned to find out! See you soon for October's update! Hello again! I'm late with this month's edition of snapshots, but you were expecting that, weren't you? August again was a very mild month. We really got off lightly this winter. There have been plenty of beautiful blooms in the garden, including the camellia Fairy Blush which lines my driveway, and looks absolutely stunning when the low sunlight illuminates the petals. The hellebores are in full swing as well and I have several different varieties now. In the picture above you can see most of my different ones. The only named varieties are the two in the middle - the white double is Mrs Betty Ranicar, and the purple anemone is Tutu. 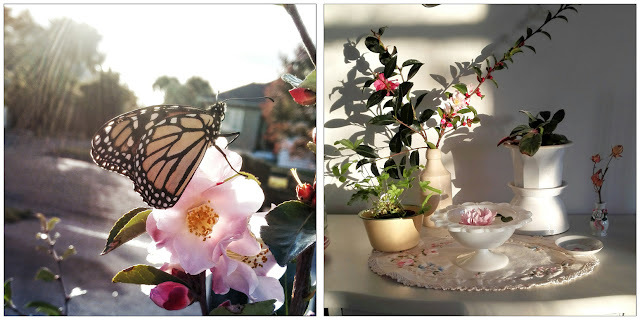 The camellias and hellebores have been great for picking, and all have featured heavily in my Instagram photos this month. Here is a couple of flat lays I did with some hellebores (and also a lovely print by my Instagram friend @atelier_cocon_m). And also, a pair of crochet cuffs I designed and made. I'm really happy with the way they turned out! I'd had the design in my head for quite a while, and to have them actually work out the same way is quite a feat! 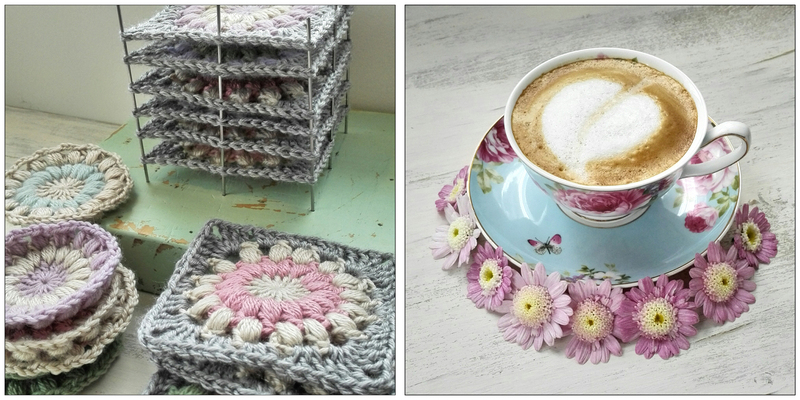 I do intend to write up the pattern and publish it here eventually, but it will probably be a while... you know me! 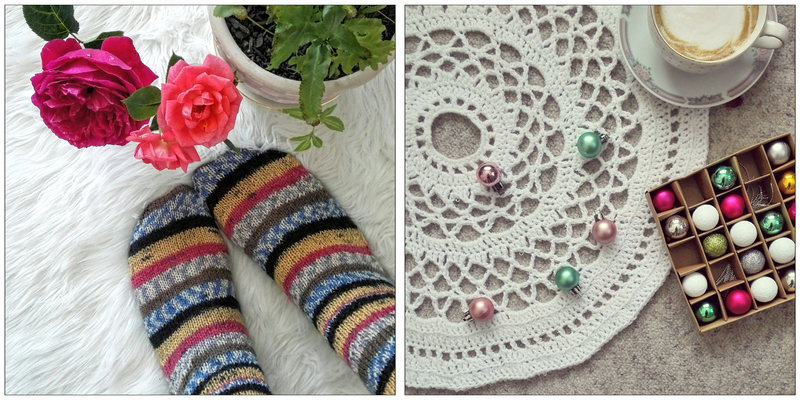 My other exciting crafting achievement this month is this - I knitted my first pair of socks! I'd been wanting to do this for ages, but always felt too intimidated to try. 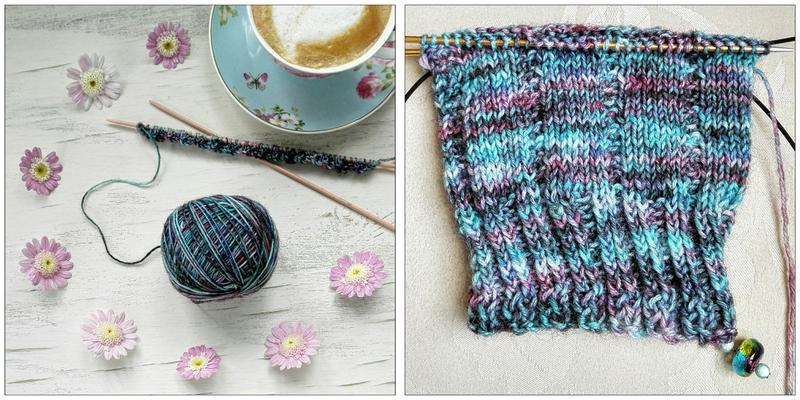 I'd seen a few people recommend the Sockalong tutorial by Winwick Mum, so eventually I decided to give it a go. Well, it worked a treat, and I discovered that actually, knitting socks is not that difficult! 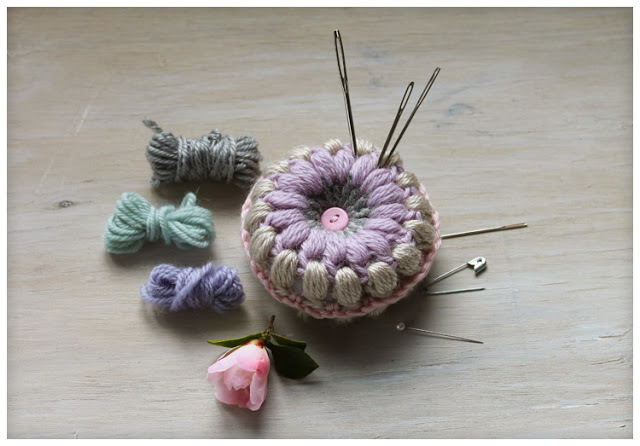 The Winwick Mum tutorial has lots of photos and clear instructions for different needles (I used long circular, also known as Magic Loop). Now, I'm not saying these socks are perfect or even very good at all. They are in fact quite bad. The second sock I knit turned out baggier than the first, and I realised (I hadn't even noticed as I was knitting) that my tension had gotten really loose. 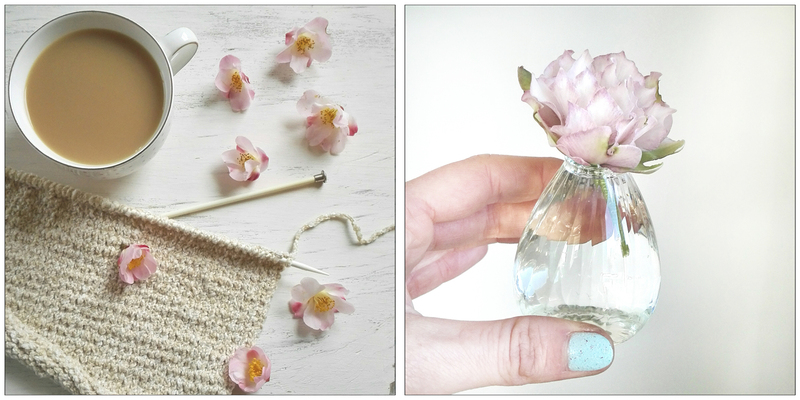 Tension in knitting seems to be a lot more difficult to control than in crochet. I had this trouble with my Linus shawl too - some rows are really loose, and with others I was struggling to get the yarn off the needle! So there are plenty of areas to work on before I can be a good knitter. I have cast on another sock though, so hopefully there will be a bit of an improvement with my next pair! Another project this month was my In The Yarn Garden cushion. I started making the back piece, but didn't get much further than this. Podrick (red) and Ini (blue) have been as cute as ever this month! We got them a climbing tower (thanks Kmart!) which they love to play on. It wobbles quite a lot, but that doesn't deter Podrick from climbing right to the top platform and curling up on it to sleep. Sometimes he'll have a lovely big stretch and roll right off. (He always manages to grab onto the pole on his way down!) Ini gets into the box to sleep. 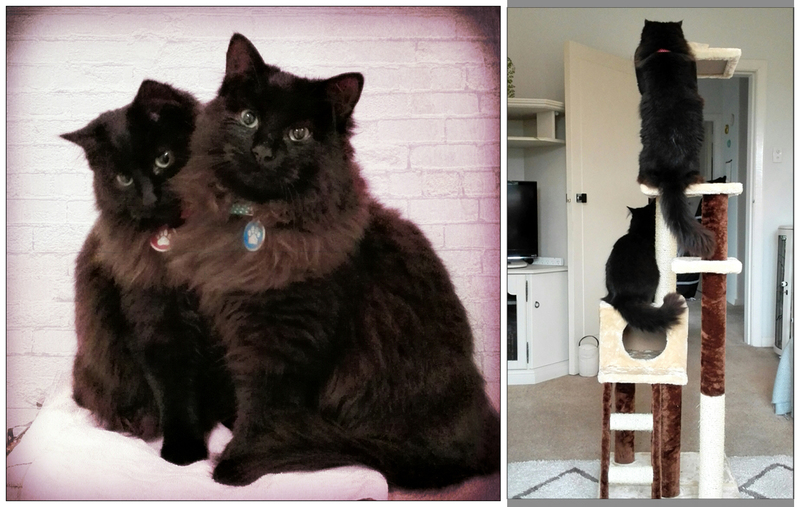 And they both love chasing each other right up to the top, clambering up the pole like little monkeys. All right, that's it from us this month! Spring has now arrived... and I'll tell you all about it at the end of September. 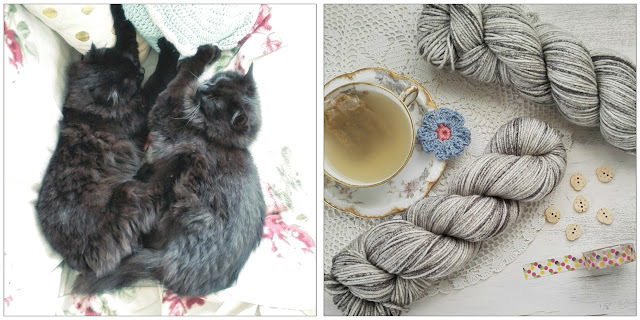 Hello again and welcome to my July recap told through snapshots from my phone! At the start of the month I was busy with my Jack and Lydia project basket. 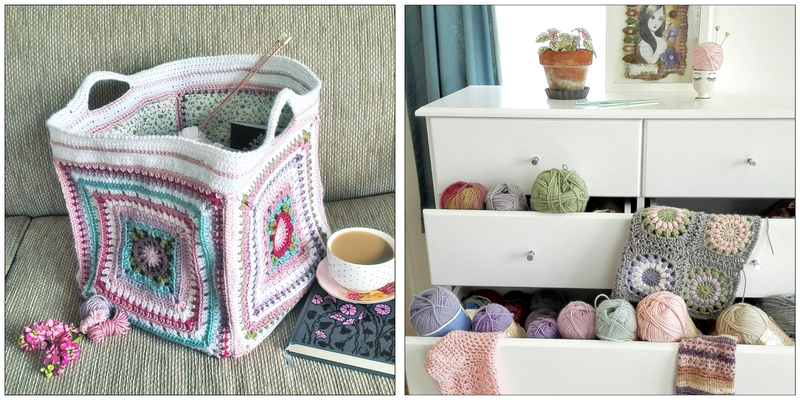 I'd made all the squares for the sides and finished up with a large multicoloured granny for the bottom of the bag. Possibly a waste of time since it won't be seen, but enjoyable all the same! 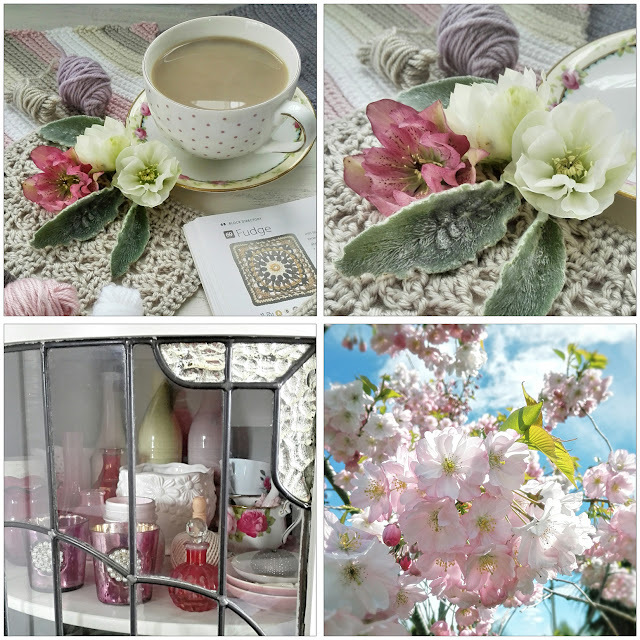 Then one cold and drizzly morning, I sat inside with the sewing machine and whizzed up lining squares, of interfacing covered with a pretty floral print cotton. I even made pockets. And after that I carefully hand sewed each lining inside the square (not as tedious as it sounds, since I watched lots of awesome crafty podcasts while I did it). 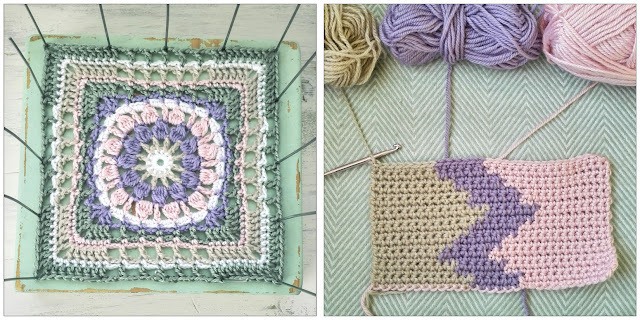 The sewing was the hardest part of the whole project - crocheting the squares was fun and easy, and joining them will be a breeze. Oh, yes I did say "will be"... I have a really terrible habit of getting a project finished to at least 90%, so close that I can almost see the finish line, and then losing interest and moving on to something else. 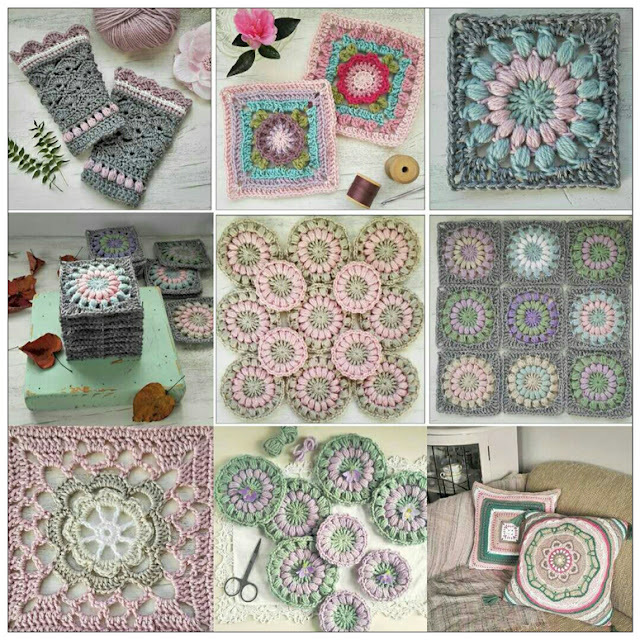 So here at the end of the month, these pretty squares are still sitting in a stack, just waiting for me to join them all together and make the handles. It will be so quick and easy, and yet I am not remotely interested in doing it right now. Oh well. I wanted to practice my knitting some more, so I knitted a very basic square in stockinette. This was going to be sewn up in the shape of a toy bunny, according to something I saw on Pinterest. The knitting itself went well even though the yarn (a chenille from my stash) turned out not to be the easiest to work with (there's absolutely no give in chenille!) but I didn't really measure, and when I came to sew the bunny it turned out to be a lot bigger than I had thought. And just like that I didn't like it any more! So that's two project fails in one month... not a great start! Weatherwise it's been cold and frosty, but aside from that pretty settled. A lot of the country has been having rain and/or storms, but it all seems to have been going around us here in Christchurch. Most weekends I've been able to get outside and work for a few hours doing a bit of cutting back and tidying, and I got my garlic planted. 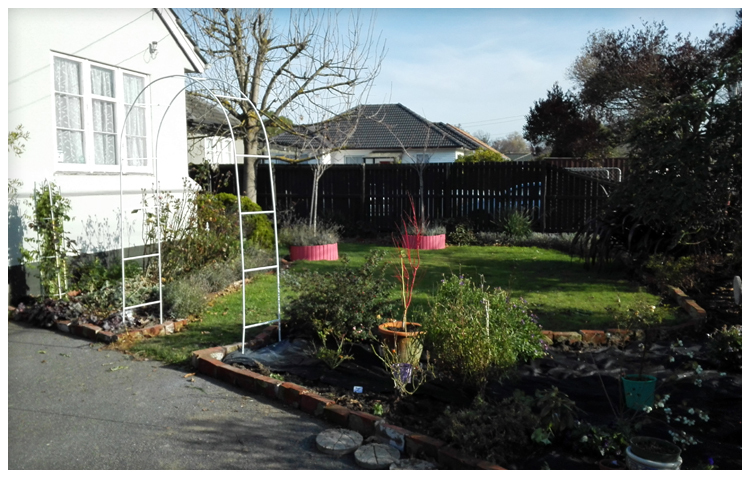 I also finished planting and weed matting the front garden. I'll do a proper photographic tour in spring when it's all filled in a bit. 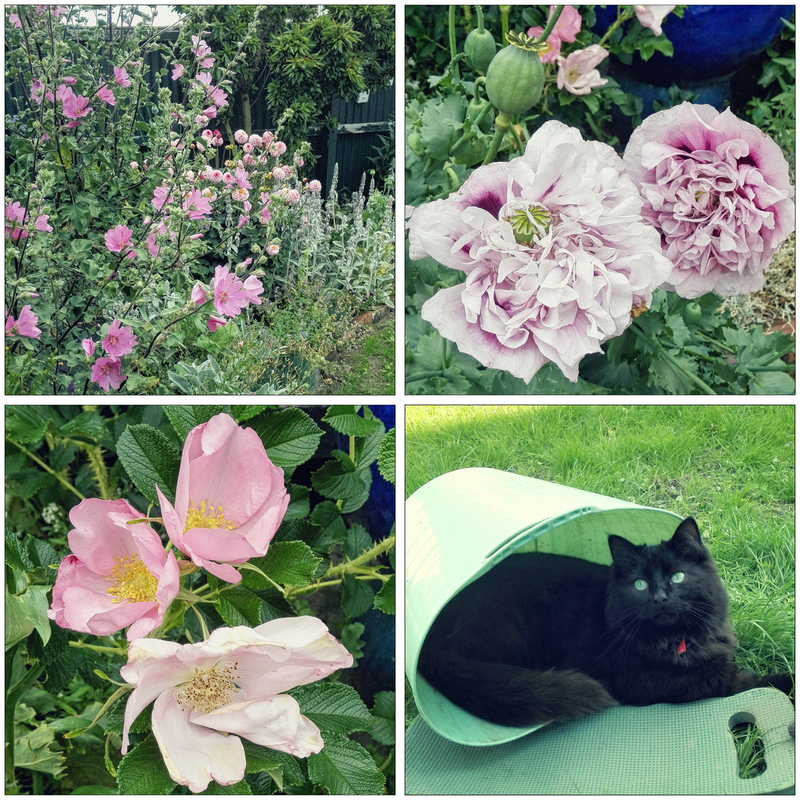 But to sum it up, there is a climbing rose planted next to the arch (it's one I took as a cutting, and I may or may not keep it depending on the colour.) I also have some star jasmine cuttings to plant on the other side, but they are very slow growing, hence the rose. The maple tree in the terracotta pot is probably temporary until I find a better small tree. There are three rose bushes, a snowberry bush, a small rhododendron and some peonies in the bed. A penstemon in the middle and a camellia that I transplanted from the back garden. I'm looking forward to seeing it all filled in a bit! I'm also pleased to call it finished for now, so I can move around to the back garden and the new bed that's been dug there... hopefully I'll have more of an update for you on that next month. 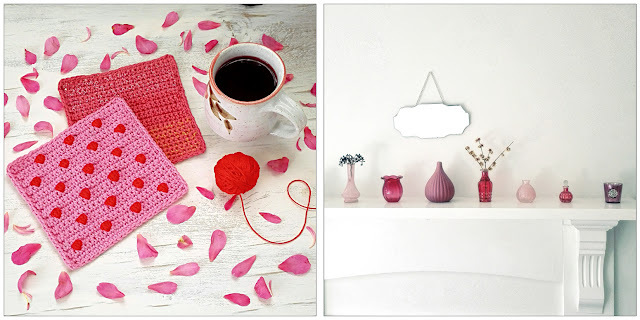 Early in the month I became aware of a crochet along being hosted by Charlotta of In The Yarn Garden. I've always admired Charlotta's work so I ordered some yarn from Wool Warehouse. It's a mixture of Drops cotton Love You 6, Love You 7 and Safran. I'm using a 3.25 mm hook. The project turned out to be a cushion cover, and a new part was released each week. I worked fast to keep up so I could share my progress on Instagram, and here is my progress over the month. Here are Podrick and Ini looking all sweet. In fact they had tired themselves out after being complete monsters! They woke me up early by jumping all over the bed and ultimately knocking over a lamp. Then all morning they chased and fought and jumped on each other, clawed furniture, knocked the things I was working on off the table. I tried shutting them outside and they sat outside the screen door and scratched it. Then I heard odd bangs at the door and when I looked outside, one of them was climbing the screen door! Honestly... children! I got ready to go out and that was when they decided it was nap time. 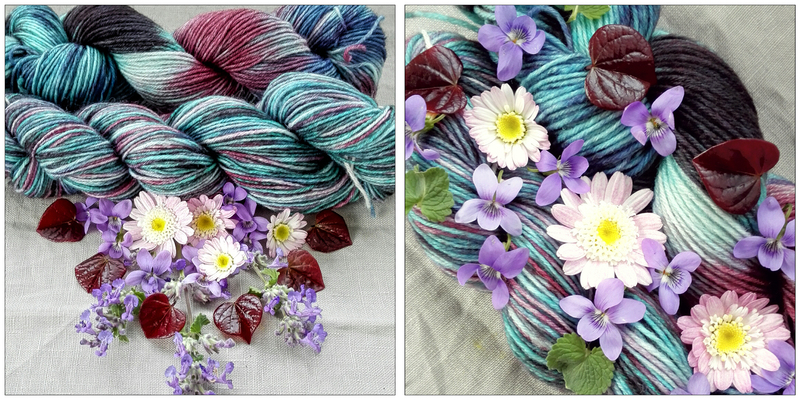 I also had another lovely yarn club delivery from Little Woollie. This is Cascade 220 Superwash, a DK wool. Another great stash enhancement! July flowers are some of my favourites. 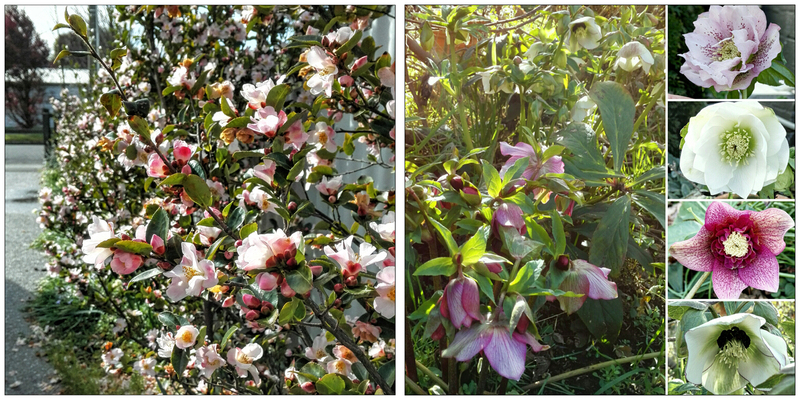 Pretty pretty camellias and hellebores. It's always magical to see a butterfly on a warm winter's day. 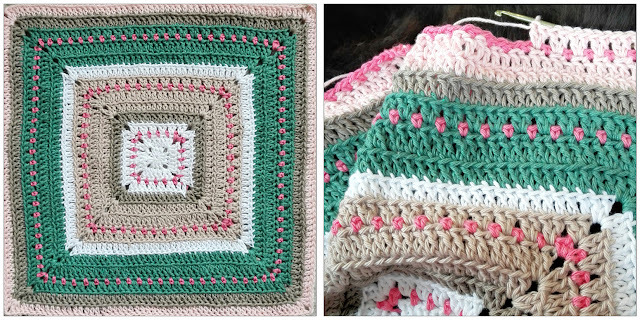 I contributed some squares for #Jennysblanketofhugs - a project being organised by Kate at Just Pootling. 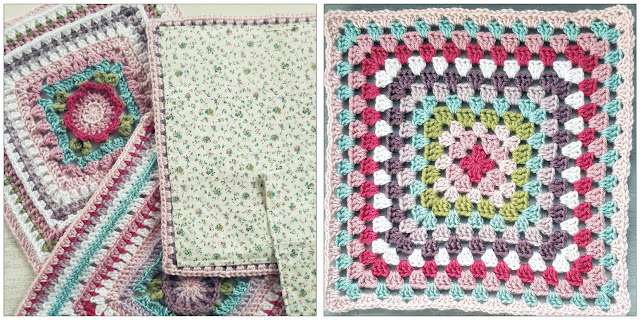 This is a blanket to show love and support for Jenny, daughter of Amanda (Little Box of Crochet) while she undergoes radiotherapy treatment. 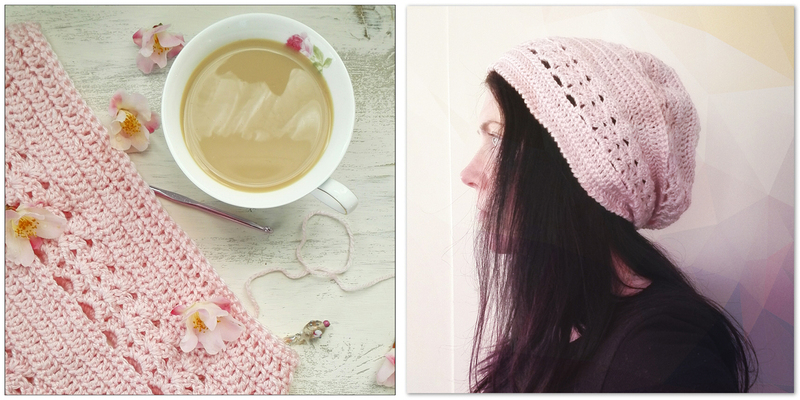 I also made myself a hat as the one I have is too itchy! This is just a cheap acrylic but it doesn't make me itch so it's a win. The pattern is Hyde Park Hat. That's it from me this month! See you at the end of August with the next edition.